Scrapcat Cards by Linda: Wrapping! Do you ever get something you just don't have any idea how you are going to wrap it? Well I sure had fun with this package. It was like a huge canvas and so much fun. Such a fun idea, and so creative, I bet she loves this gift and your creative way of wrapping and decorating. Ohhhhhhhh this is an AWESOME idea!!! I loveeeeeeeeeeeee it!!! Just beautiful!!! 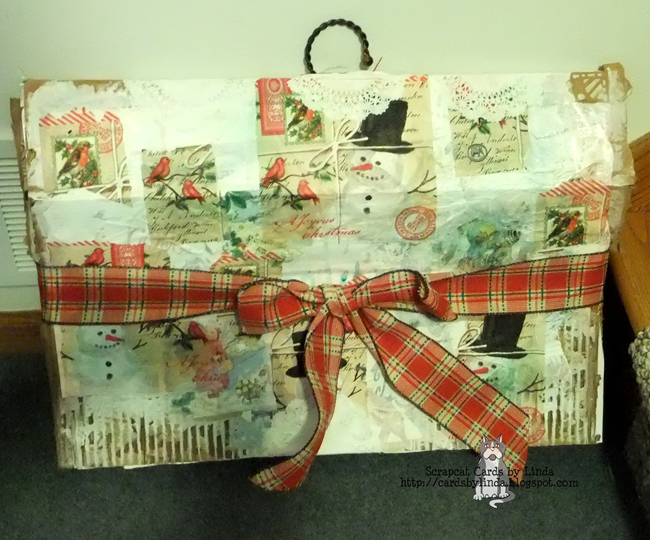 very cool Linda- sometimes I too think it can be more fun wrapping then anything! lol I love to decorate boxes and envies! Merry Christmas! Love this idea! Thanks for sharing!!! I just watched a few if your you tube videos, and wowzers I'm totally a new fan!! !